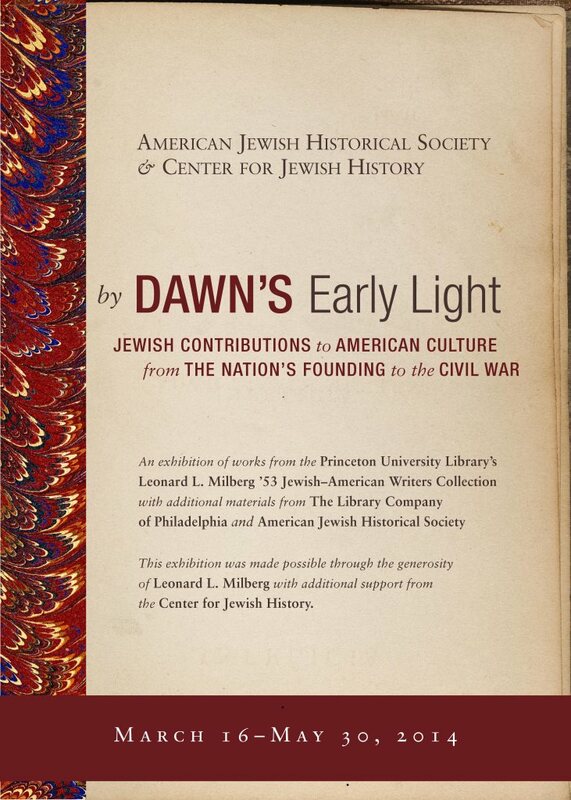 ❧ “By Dawn’s Early Light: : An exhibition of more than 140 books, maps, prints, manuscripts, and paintings documenting Jewish contributions to American culture from the nation’s founding to the Civil War, opening on March 16 at the Center for Jewish History. On display are many items from the Library’s Leonard L. Milberg ‘53 Collection of Jewish-American Writers as well as loans from the Library Company of Philadelphia, the American Jewish Historical Society, and Mr. Milberg’s personal collection. A representation of Columbus’ landing on an island in the Bahamas, with caption “Concerning the recently discovered islands in the Indies sea.” Note portion of land labeled “Insula hyspana.” This illustration appears in the [Basel:] I.B. [Johann Bergmann, de Olpe] 1494 edition (Goff V-125). ❧ Columbus’s description of his first voyage first appeared in print in a Spanish edition published in Barcelona in 1493. Within four years it had gone through fifteen known editions, including seven Latin editions, one German edition, a paraphrase in Italian verse in five editions, and a second Spanish edition, Valladolid, about 1497. These fifteen different editions were products of presses scattered in ten cities across Europe. http://arks.princeton.edu/ark:/88435/xp68kh56z and the Scheide Library copy. ❧ Annotated Books • The PUDL’s digitization of annotated printed books in Firestone Library continues, with the addition of seven additional titles, including Gabriel Harvey’s annotated copies of Machiavelli’s Arte of Warre; Buchanan’s De Maria Scotorum regina and his Detectioun of the duinges of Marie Quene of Scottes; Smith’s De recta & emendata linguæ Anglicæ scriptione, dialogus; Freigius’s Paratitla … juris civilis; Magnus Olaus’s Historia de gentibus septentrionalibus; and Melanchthon’s Selectarum declamationum. 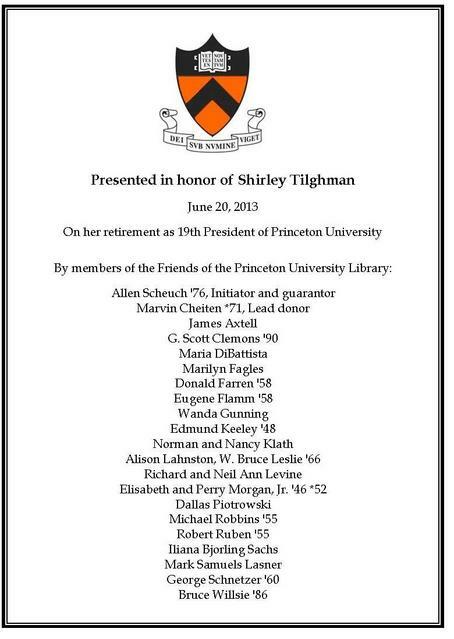 The retirement of Shirley Tilghman as the19th President of Princeton University at the end of June 2013 provided an opportunity for the Friends of the Princeton University Library to celebrate the presidency of the University by making a gift to the Library in her honor. The Special Collections curators presented a wide range of possibilities to identify a suitable purchase. The choice: one of the extremely rare books that can be documented as having belonged to Jonathan Dickinson (1688-1747), the first President of the College of New Jersey. At its modest beginning in 1746 in Dickinson’s parsonage in Elizabeth, the college consisted of the president, one tutor, and eight or ten students. Dickinson’s books were the college library. Tactica Sacra (Sacred Strategies), by John Arrowsmith, Puritan divine of Trinity College, Cambridge, is a manual for the spiritual warrior, part of the armament of clergyman Dickinson. A large quarto of 400 pages in its original 17th-century full calf binding, the book carries an inscription on its title page in Dickinson’s hand: “Jonathan Dickinson’s Book… .” The group of Friends who supported the acquisition are named on a bookplate added to the volume. The University’s efforts to acquire books with a Princeton association started in earnest during the second half the 19th century. The extant books belonging to Jonathan Edwards were added, as well as some from other early presidents, including Samuel Finley. John Witherspoon’s books had been acquired in the first part of the 19th century due to the efforts of his son-in-law Samuel Stanhope Smith. These volumes were purchased not so much because they had belonged to Witherspoon but because, after the Nassau Hall fire of 1802, the college needed books. 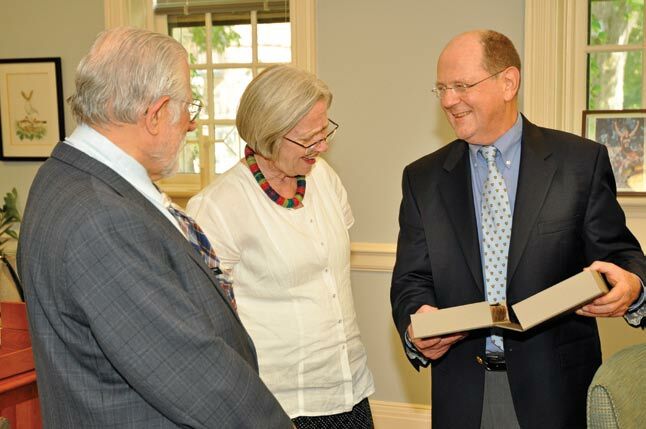 Recognition of the associational value of the Witherspoon books came to a climax during the librarianship of Julian Boyd. In the early 1940s Boyd instructed rare book librarian Julie Hudson to reassemble the Witherspoon library, which had been dispersed throughout the collections. The earliest survivors of the college library are on view in the Eighteenth-Century Room, just inside the entrance to the Main Exhibition Gallery in Firestone Library. In addition to the Dickinson inscription, a hitherto unknown early American book label, “Samuelis Melyen liber,” is fixed to the front pastedown. The Reverend Samuel Melyen was the first minister of the nascent congregations in Elizabeth and environs. Jonathan Dickinson married Melyen’s sister Joanna in 1709, around the time that he began his ministerial work in the Elizabeth Town parish. Melyen died ca. 1711, and Dickinson emerged as the leading minister, a post he held until his death in 1747. Samuel Melyen was clearly the first owner of this book. Dickinson’s inscription in full states that it was a gift of one Mr. Tilley: “Jonathan Dickinson’s Book Ex dono D. Tilley.” The Tilley family and the Melyen family were related by marriage, but the precise identity of “D[ominus (i.e. Mister)]. Tilley” is not yet known. Dickinson apparently owned another book in which he inscribed “Jonathan Dickinson’s Book Ex dono D. Tilley.” It is a copy of Samuel Cradock, The Harmony of the Four Evangelists (London, 1668). The present whereabouts of this copy are unknown; it was last recorded in 1896. Further, recently come to light is a comparably inscribed book held at the Hougton Library: a London, 1688 edition of the Psalms [Details] [Image]. The Princeton association of the Tactica Sacra does not stop with Dickinson. Beneath Dickinson’s inscription is the following: “Jonathan Elmer His Book 1768.” Elmer (Yale 1747) was pastor at New Providence, New Jersey, from 1750 onward. A slip in the book states that after Jonathan Elmer it was owned by Philemon Elmer (1752-1827); then his daughter Catharine, who married Aaron Coe, Princeton 1797 (d. 1857); then by their son the Reverend Philemon Elmer Coe (Princeton 1834); then his sister Catherine Elmer Coe, who married Alfred Mills (Yale 1847); then by their children Edith, Alfred Elmer Mills (Princeton 1882), and Edward K. Mills (Princeton 1896). A 2011 posting on the blog “Revolution in Fiction” stated that the Princeton copy of Le Miroir des événemens actuels was missing. Detail from Glarean’s Chronologia with annotations in the hand of his student Gabriel Hummelberg II. This issue of the Chronologia was published as part of an edition of Livy’s history of Rome published by Michael Isengrin in Basel in 1540. Call number: (Ex) 2010—0227q. [Acquired by the Princeton University LIbrary in December 2007]. Currently on view in the lobby of Firestone Library through Commencement. The Princeton University Library and the Class of 1953 join in honoring the author John McPhee on the occasion of his 60th class reunion. McPhee has been a Ferris Professor of Journalism at Princeton since 1974, leading two seminars every three years. The present exhibition focuses on McPhee’s approach to factual writing, which is central to his teaching at Princeton and has contributed to the success of his many students. The exhibition shows stages of the creative process, from concept to bound book and beyond. McPhee’s own papers show the author at work, beginning with information gathering in the field and formalizing his notes. McPhee structures his writing with the help of diagrams, as explained in his recent article, “Structures,” in The New Yorker (January 14, 2013). Then, working with editors and publishers, he crafts a series of manuscript drafts and corrects proofs. The resulting articles, first published in The New Yorker and, occasionally, other magazines, have been the starting point for most of McPhee’s twentyeight books and two readers published by Farrar, Straus and Giroux, as well as reprints, e-books, and translations. Included in the exhibition are loans from Farrar, Straus and Giroux and The New Yorker, as well as papers and awards loaned by the author himself. 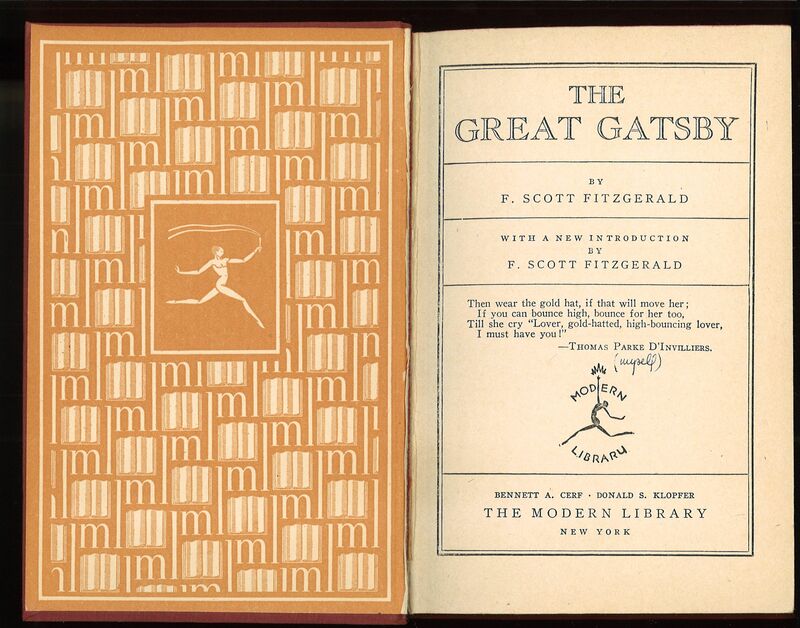 Like the novel itself, the epigraph of The Great Gatsby has achieved mythic status. Who was Thomas Parke D’Invilliers? First appearing in This Side of Paradise, he is the poet-companion of Amory Blaine and carried the epithet “that awful highbrow.” Here, on the title page of Fitzgerald’s third novel, D’Invilliers provides paratextual poetry. Custom expects real authors to provide epigraphs. His signed epigraph reverses what we understood him to be when we first met him. 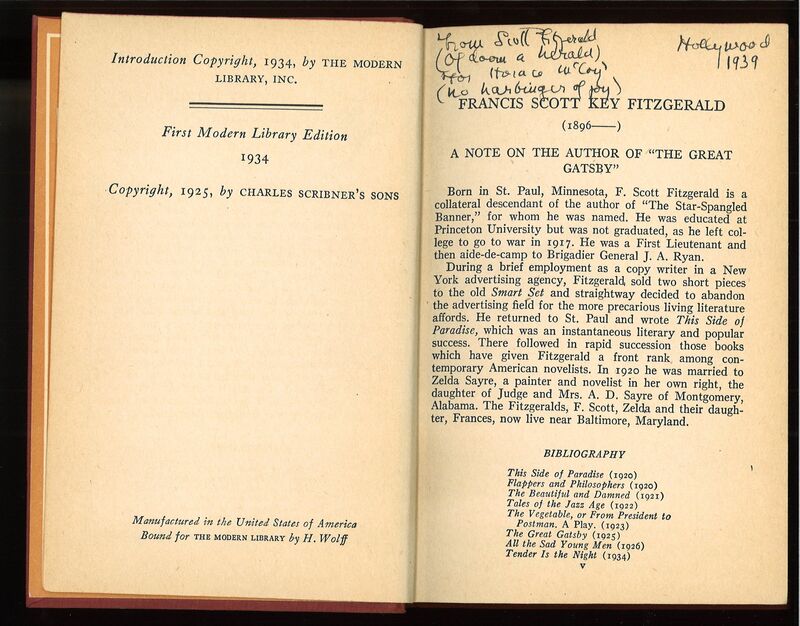 A recent gift of a presentation copy of The Great Gatsby provides documentary evidence of what has long been assumed regarding Fitzgerald’s authorship of the epigraph. Moreover, this copy has an added attraction. The presentation inscription is the autograph original of a Fitzgerald poem. Horace McCoy was a novelist and near contemporary of Fitzgerald. McCoy is best known for his novel They Shoot Horses, Don’t They? (1935). The gift is a legacy to the Library from the Lawrence D. Stewart Living Trust. Prof. Stewart purchased the book in an California bookstore and published his findings in 1957 —- Lawrence D. Stewart, “Scott Fitzgerald D’Invilliers,” American Literature, XXIX (May 1957), 212-213. [Stable URL http://www.jstor.org/stable/2922109.] His article did not reproduce the signed title page nor the autograph presentation. Wrapped in paper and tucked in the protective case of Tong Jian Zong Lei (通鉴总类), a Chinese history book, were four aging black-and-white photographs. With frayed edges and small stained spots, the pictures have nonetheless retained their sharpness, allowing us to see what a skilled photographer had captured through his curious lens one century ago in the hometown of Confucius. Fading handwriting on the back of each photo provided precious clues to their content and provenance. The history book, compiled by SHEN Shu of the Song Dynasty (960-1279) and printed in 1363 during the late Yuan Dynasty (1271-1368), is part of the private Scheide Library collection housed in Firestone Library at Princeton University. The photos, according to notes on the back, were taken by a physician named Charles H. Lyon and presented to John Hinsdale Scheide (1875-1942, Princeton class of 1896) by Mrs. Lyon in January 1937. The first photo is a portrait of a round-faced Chinese man in the official robe and headwear of the Qing Dynasty. If the ink note scratched on the back, “a descendant of Confucius,” is reliable, the subject of the photo is KONG Lingyi (孔令贻, 1872-1919). As a seventy-sixth generation descendant of Confucius in the male line of descent, Kong inherited the title “Duke Confucius” (衍圣公) from his father at age five. The note also indicates that Dr. Lyon, the photographer, is the “physician to the subject.” It is unclear how often Kong had sought Dr. Lyon’s medical expertise, but interacting with Westerners from afar and posing for photographs would not have been out of place for Duke Kong. European ambassadors and colonial administrators had paid visits to the Confucius Temple in Qufu (曲阜), Shandong Province, and had photos taken with the Duke, who lived in the Kong family mansion adjacent to the temple complex, as generations of the sage’s offspring had done. In a photo held at the National Archives in London, a slightly younger-looking Kong is seen with Reginald Johnston (1874-1938), a Scottish colonial officer who had escorted a portrait of King Edward VII to Confucius’s hometown (and who later became famous for having tutored China’s last emperor, Puyi). What is remarkable about the portrait taken by Dr. Lyon is that it is a half-body shot of the Duke. During the late Qing dynasty, when cameras were still a novelty to the Chinese, it was taboo to photograph less than a full-body shot of a person, because it was deemed bad luck to have the subject missing arms, legs, or other body parts in photos. Was Kong informed of the outcome of his photo, and was he comfortable about it? As a physician, did Dr. Lyon hold any power of persuasion over Kong, assuring him of the harmlessness of a partial-body picture? At any rate, Lyon’s photograph offers a rare close-up view of the second-to-last Duke Confucius in Chinese history. Three other photos were taken in and outside the Confucius Temple, where ritual ceremonies were performed every year to worship the sage. Photo no. 2 shows an arch named Que li (阙里), which stood outside the east wall of the temple. Confucius was believed to have started his teaching career in this neighborhood, hence the location of the temple. Photo no. 3 is a front view of the statue of Confucius in Da cheng dian (大成殿, meaning “the Hall of Great Achievements”), which was the architectural center of the temple complex. The statue was inaugurated in 1730 (the eighth year in the reign of Emperor Yongzheng), replacing an earlier one destroyed in a fire in 1724. The fourth photo focuses on the porch of the hall, which is guarded by limestone pillars carved with dragons riding clouds. Lyon would never know that he had captured the image of vanishing cultural relics. In 1966, twenty years after Lyon died at age 72 in Phillipsburg, New Jersey, the Great Proletarian Cultural Revolution broke out in China, followed closely by the “Destruction of Four Olds” campaign. Confucius’s legacy was a prime target among the “old ideas, old culture, old customs, and old habits” to be condemned and eradicated from Chinese society, ostensibly to make room for a brand new world. Hundreds of Red Guards swept into the temple, mansion, and cemetery of Confucius in November 1966, smashing up statues, stone tablets, monuments, and numerous other antiquities. The tombs of Confucius and KONG Lingyi, who died in 1919—one year after Dr. Lyon left China—were both leveled. The Hall of Great Achievements was stripped of statues of Confucius and sixteen of his most famed followers, except for a broken head left among the ruins. The Internet is not short of violent images showing Red Guards in fervent action in Qufu. Online photos revealed that, before being reduced to debris, the 236-year-old statue of Confucius had been disfigured and disgraced by the “revolutionists” who had plastered strips of paper with blasphemous slogans all over it. With the same determined pursuit for visual clarity with which he had taken Duke Kong’s portrait, Lyon had positioned his lens straight in front of the sage’s statue, taking in the exquisite latticed boards and a pair of lively-looking dragons about to untangle their bodies from the columns. Lyon’s photo is not the only one of the Confucius statue that was no more. However, compared with what we have found in print and digitized resources, his shot is clearly the one that best allows us a belated gaze into the (now ruined) entire shrine from a satisfactory angle. According to the restoration team, the only deliberate point of departure from the original statue was the sage’s facial expression. Launched in 1984, the new statue of Confucius gently smiles down at his worshippers. Local residents were reportedly happy with the reinstated, amicable-looking Confucius, commenting that they used to find his old statue “really scary” (Gong and Wang 62). Such a hearty welcome almost made the silver lining of the massive loss from the “Four Olds” campaign. However, with the aid of Lyon’s photo record, might the jury still be out on whether the old statue truly presented a forbidding expression? We do not know much about Dr. Lyon and his family or about the couple’s relationship with John H. Scheide. Lyon was born in China to a missionary family possibly from Wooster, Ohio. He graduated with an M.D. degree from the University of Pennsylvania in 1898, and, as a member of the Student Volunteer Movement for Foreign Missions, went to the Philippine Islands in 1900. By 1902 he had become a medical missionary in Jining (济宁), Shandong Province, working as the chief physician of the Rose Bachman Memorial Hospital for Men, which was operated by the Board of Foreign Missions of the Presbyterian Church in the USA. More than a century later, that hospital, now called the Jining First People’s Hospital, is still in business (and accepting patients of both genders). Lyon married Edna P. van Schoick in Shanghai on Dec. 19, 1902. The two met when Lyon visited Edna’s father, Dr. Isaac Lanning van Schoick, who had returned from a mission in China to his home in Hightstown, New Jersey (“Going to China” 9). Indeed, one of the places in which Dr. Van Schoick had been stationed was Jining, to which Edna was perhaps no stranger. Lyon’s hospital was approximately 35 miles west of Qufu, the birthplace of Confucius. An excursion to Qufu on the back of a horse or donkey along the rural mud road could take several uncomfortable hours, longer if by sedan chair. With a healthy dose of curiosity and determination and the cool-headedness of a physician, Lyon helped preserve the image of what would be demolished by unprecedented political fervor. The digitized photos and their catalog record can be found by searching “Temple of Confucius in Qufu” (call number 3.1.19) in the library catalog. We would like to thank the University of Pennsylvania Archives and the Philadelphia Free Library for offering generous and timely assistance in locating Charles H. Lyon’s biographical information for us. The East Asian Library of Princeton University kindly created a detailed bibliographical description of the photos. 1724: A lightning strike sparks a fire in the Temple of Confucius in Qufu, Shandong Province, destroying the statue of Confucius. 1730: The temple is restored after a five-year reconstruction project. 1872: KONG Lingyi, a seventy-sixth generation descendant of Confucius, is born in Qufu. ca. 1874: Charles Hodge Lyon is born into a missionary family in China. 1898: Lyon graduates from the University of Pennsylvania with an M.D. degree. ca. 1902: Lyon becomes a medical missionary in Tsining-Chou, China (now Jining of Shandong Province in northern China), serving as a physician at the Rose Bachman Memorial Hospital for Men. 1902: Lyon and Edna P. van Schoick are married in Shanghai on December 19. 1918: Lyon returns to the United States. 1919: Duke Kong dies in Beijing at age 47. 1937: Mrs. Lyon presents the photos taken by Dr. Lyon to John H. Scheide (Princeton class of 1896) on January 19. 1946: Lyon dies in Phillipsburg, New Jersey. 1966: Red Guards attack the Confucius temple, mansion, and cemetery, and destroy numerous antiquities, the statue of Confucius among them. 1983: The government funds the recovery of the Hall of Great Achievements, aiming for a faithful replication of the statues built in 1730. 1984: By August, all seventeen statues have been restored. The inauguration ceremony is held on September 22, speculated to be the 2,535th anniversary of the birth of Confucius. “Charles Hodge Lyon.” Journal of the American Medical Association 131.6 (1946): 547. Web. “Dr. C.H. Lyon Dies at Age of 72.” Philadelphia Inquirer Apr. 21, 1946: 10. Print. Gao, Wen, and Xiaoping Fan. Zhongguo Kong Miao [Confucius temples in China]. Chengdu Shi: Chengdu chu ban she, 1994. Print. “Going to China to Become a Bride.” The New York Times Oct. 25, 1902: 9. Web. Gong, Yanxing, and Zhengyu Wang. Kong Miao Zhu Shen Kao [Deities in the Confucius Temple]. Jinan: Shandong you yi chu ban she, 1994. Print. Kong, Fanyin. Yan Sheng Gong Fu Jian Wen [A history of the mansion of Duke Confucius]. Jinan: Qi Lu shu she, 1992. Print. Pan, Guxi, et al. Qufu Kong Miao Jian Zhu [Architecture of the Confucius Temple in Qufu]. Beijing: Zhongguo jian zhu gong ye chu ban she, 1987. Print. “Rose Bachman Memorial Hospital for Men.” Western Medicine in China, 1800-1950. Web. Apr. 19, 2013. <http://www.ulib.iupui.edu/wmicproject/node/336>. Shandong Sheng wen wu guan li chu, and Zhongguo guo ji lü xing she Jinan fen she. Qufu Ming Sheng Gu Ji [Places of historical interest in Qufu]. Shandong ren min chu ban she, 1958. Print. The Keys of the Kingdom. Dir. John M. Stahl. 1944. Film.